I can’t help but get utterly lost inside of a Thomas Kinkade painting when I gaze upon it. The way that the winter time is depicted in his paintings creates a longing in me to just climb right into that world, all bundled up in a thick winter coat, complete with a soft woolen scarf, knit cap, mittens and striped stockings, and a pair of ice skates dangling over my shoulder as I carry them home from just having skated on the tiny, frozen pond at the end of the lane. It is the kind of winter time that my heart longs for, aches for, but can only find in those paintings these days; or in my vivid recollection of the winters of my youth, growing up in Michigan. There, the winters would be powdery white and bitterly cold; they were crisply sharp, yet gloriously magical, and I remember them seeming so very silent. Quiet. You see, winter time beckoned me to draw near to all things warm and cozy, soothing and comforting; it inspired in me gratitude for all of the warmth that life held within it, which was the opposite of the toe-tingling frigidness I felt while outdoors. But it was all wonderful; and each and every year when winter rolled around, it was clean and new, and fresh. It glistened and twinkled, sparkled and shimmered; it gave the luminous moon a mirror of snow to look down upon and smile at, so that it, too, could witness its own face reflected back, however fuzzily. Winter time, the kind of my youth and the kind of Thomas Kinkade paintings, is something that I hold very dear; and I try to find a little piece of it in my life now, to have a little taste of it, if I can. And when I do find it, does it ever taste good as it melts away on my tongue. If the heart of the home is the kitchen, then the warm glowing center of the kitchen is the oven. What comes out of the oven, especially in the cold months, offers comfort to the soul, and fulfillment to the appetite. Cravings for the toasty, the golden, the sweet and the fragrant wash over me so very often in the winter time. There’s joy for me in the opportunity to turn the dial on for my oven, and to create an atmosphere where there’s an invitation for one and all to come in and enjoy a taste of home, and know that love is abundantly in the air, just waiting to be breathed in. 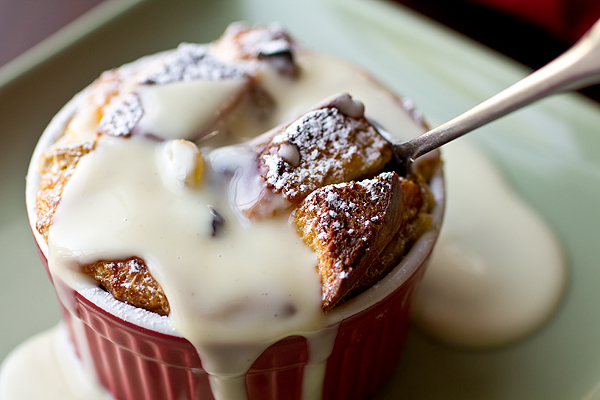 There are certain foods that are quintessential winter-time staples, and holiday favorites; and bread pudding is one of them. Golden, puffy and soft, the sweetly creamy, custardy bread melts away on the tongue, one spoonful after another. 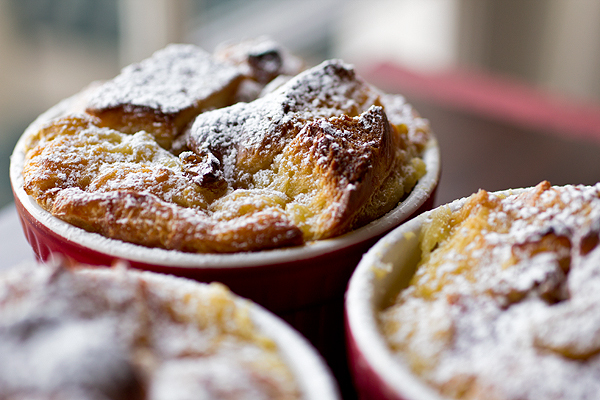 The slight fluffiness of a buttery challah bread, the chewiness of golden raisins, and a healthy drizzling of warm, fragrant, eggnog-spiced rum sauce, makes a wintery bread pudding the perfect finish to a holiday meal, or a simple treat to enjoy while curled up with a warm blanket next to a flame as it flickers and dances. 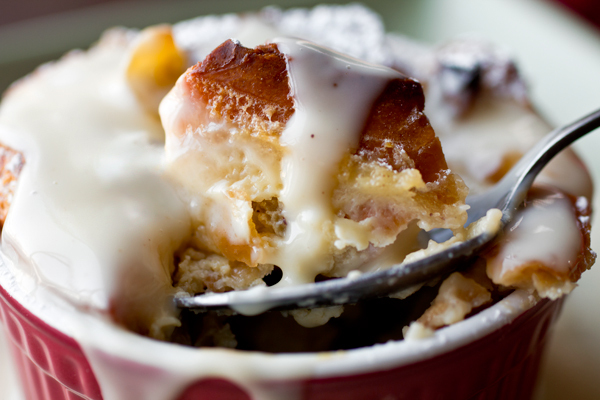 Yes, the taste of winter can be found and enjoyed by the warm spoonful of comforting bread pudding, and allowed to linger until it melts away, slowly. The joy of the holiday season inspires me to allow my imagination to flow freely, that I may climb into the winter wonderland of the paintings that pull at my heart strings when I look at them, or go back in time in my mind’s eye to my early years when the winter holidays molded and shaped a desire in me for the cozy. The season is what we each create it to be; what we each call upon it to be. And what a perfect time it is to fill our own hearts, as well as the hearts of others in our lives, with love, warmth, joy and care. And may good home-made food, the sweet and the inviting, be the catalyst that gathers us together. The colder it is outside, the warmer everything feels on the inside—one golden, sweet spoonful at a time. 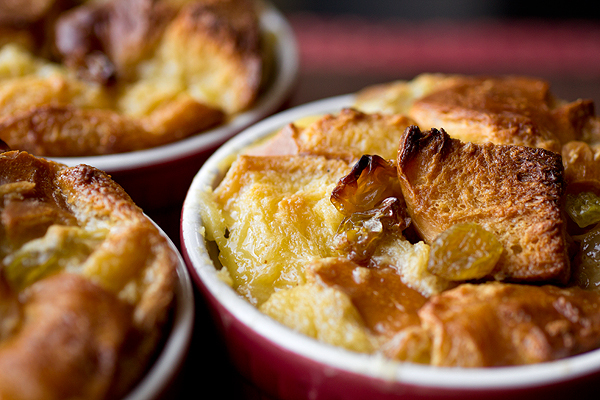 -Preheat the oven to 350 degrees, and lightly butter 8 ramekins (or lightly butter a 12 x 9½ x 2 baking dish). -Add the cubed challah bread to a large bowl; next, in another large bowl, whisk the eggs together with the rest of the ingredients through the nutmeg, and pour this custard mixture over the cubed challah bread (the mixture will seem a bit loose or “soupy”, but this is how it’s supposed to be); add in the raisins, and mix gently with your hands to incorporate the custard and the raisins with the cubed bread, and allow the mixture to sit for about 10-12 minutes; next, ladle the bread/raisin/custard mixture into the prepared ramekins (or baking dish), and place onto a baking sheet to bake the bread puddings for about 45 minutes (or about 1 hour 25 minutes if using a baking dish, covered with foil for the first 40 minutes); remove from oven and allow to slightly cool for about 10 minutes before serving. 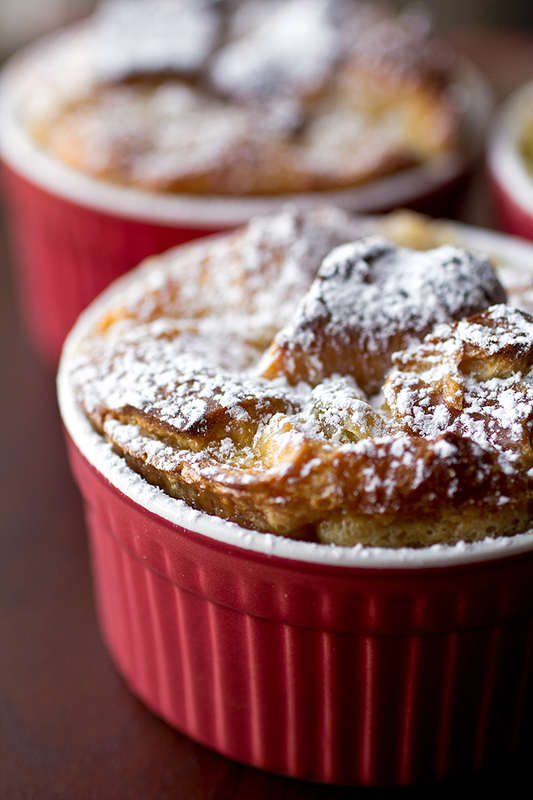 -You can serve this dessert either warm or cold (I personally prefer warm); just dust a little bit of powdered sugar over the top of each ramekin (or over the entire baking dish) and serve with some warm (or chilled) Eggnog-Spiced Rum Sauce on the side to drizzle generously over top. gorgeous photos, they really draw me in. and the oozing rum sauce is SO drool-inducing! 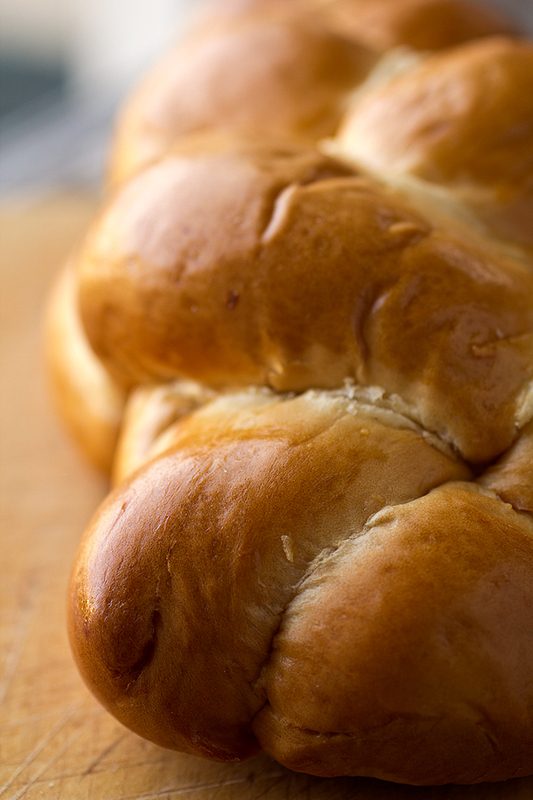 You can’t go wrong with anything challah. And that eggnog spiced rum sauce sounds absolutely divine.